I have an extreme passion for cooking and baking. I am always clipping recipes and experimenting in the kitchen. I have been wanting to share some of my recipes here on the blog. I hope to be able to share a recipe or two each month with you! This recipe was inspired by this month's issue of Martha Stewart Living where I spotted a walnut shortbread recipe that sounded delicious. 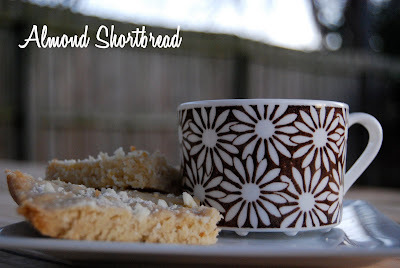 It inspired me to come up with a shortbread using almonds. We are almond addicts in my house! We made these over the weekend and they didn't last long, I'm surprised I even got a photo op....oh, so very good!! 1. Preheat oven to 350 degrees. Spread nuts onto an ungreased cookie sheet. Bake in oven for 10 to 15 minutes, until golden brown and fragrant, stirring occasionally. 2. Allow nuts to cool slightly, then place in a food processor and pulse until finely ground (right before you turn it into almond butter!). Transfer nuts to bowl and whisk in flour and salt. 3. Beat butter on medium speed until light and fluffy. Add sugar and almond extract and beat again until well combined. Slowly add the almond mixture and beat until combined. 4. Grease an 8 inch baking pan. Spoon dough into pan and press down into pan until you reach an even thickness. 5. Bake for 30 minutes or until edges are lightly browned. Cut into squares. While the shortbread is still warm, sprinkle lightly with powdered sugar. 6. Serve with your favorite tea! *Sometimes when I am making shortbreads, the dough can become extremely dry and crumbly, when this happens I usually add a very small amount of canola oil to the dough while mixing until it comes together. This will not affect texture or flavor and helps to make the dough more workable.